This has to be a windup. 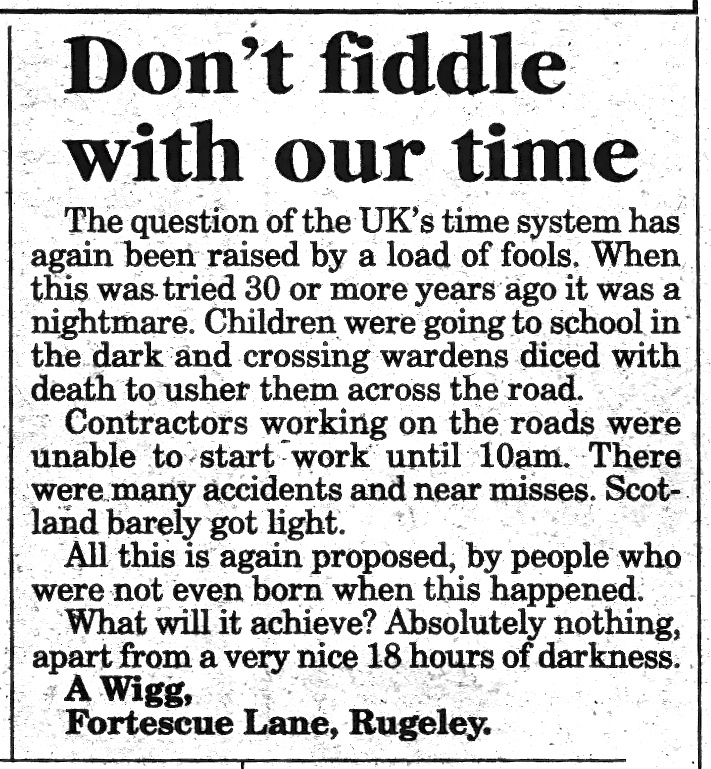 Spotted on the Express & Star letters page, Wednesday, 24th November 2010. Before branding others ‘fools’, perhaps it would be a good idea to think about how stuff works. Comedy gold. Does the extra daylight of British Summer Time fade the curtains, too? This entry was posted in Bad Science, Environment, Express & Star, Just plain daft, Local media, Shared media and tagged A Wigg, British Summer Time, Daylight Saving, double British Summer Time, Express & Star, Letters, Silly. Bookmark the permalink. Almost as amusing is the Daily Mails “Don’t Let Them Force You To Live Your Life On Berlin Time” campaign !